Although learning how to administer insulin shots was tough and took time, learning to test my blood sugar was much harder. I couldn’t stand the sight of blood. Even just hearing the word made me nauseous. Countless times in health classes I ended up going to the nurse’s office, sometimes even throwing up, because we were talking about blood. My grandma had type 2 diabetes and tested her blood sugar. I would go in the other room when she did because I couldn’t stand to see even that tiny drop of blood. Now here I was learning that I would be poking my fingertips and drawing out that tiny drop of blood at least half a dozen times a day. How was I ever going to be able to do it? My first memories of testing my blood sugar are after I was discharged from the hospital and back home. I hated seeing that drop of blood, so I would distract myself. I would watch TV and look down at my finger as little as possible. My family told me to pretend that it wasn’t blood and just think it was ketchup. I could never do that. Why would ketchup be coming out of my finger? I don’t remember a defining moment when I suddenly got over my queasiness about that tiny drop of blood. Eventually somehow I did. Now I have no problem testing my blood sugar and seeing that tiny drop of blood. 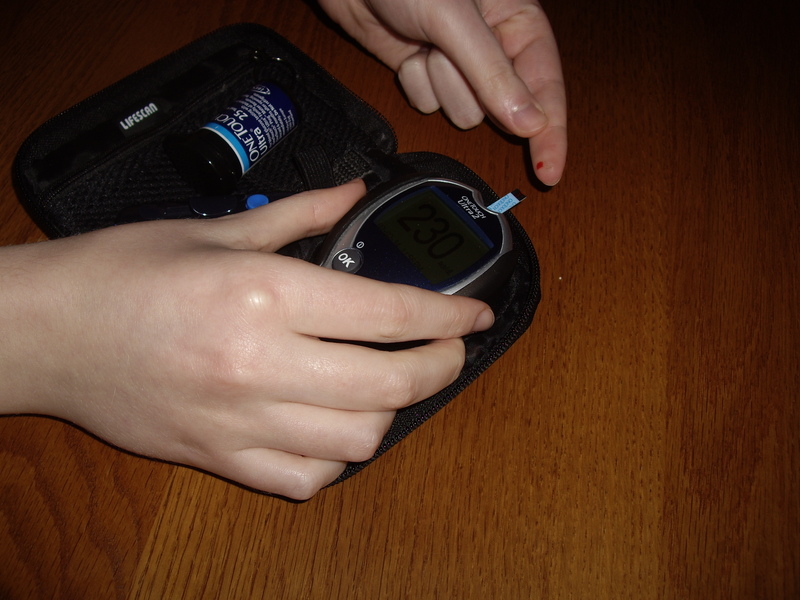 And now because of diabetes helping me get over the queasiness, I am going into nursing–a career that the 7th grader lying in the nurse’s office would never have imagined.